Almotamar.net - Dentistry and Pharmacy Faculties of Aden University , Yemen received Tuesday a collection of basic specialization books and scientific references from the World Health Organisation (WHO)’s Regional Bureau in Cairo. Dean of the Pharmacy Faculty Dr Mahdi al-Haj said the Dentistry College received today 240 books included 12 reference books in dentistry and the Pharmacy College received 200 books including 20 titles of reference books in pharmacy sciences. 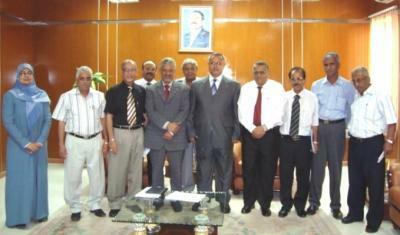 He said offering those books comes as a support by the WHO for the Aden University . For his part the Dean of the Pharmacy Faculty of Aden University said the support from the WHO Regional Bureau expresses fruits of relations of cooperation of the two parties.